Amanda Ceide and her son Kiernan relaxed after school in Malden. Ceide pulled her son from a charter school and put him back in a public school. 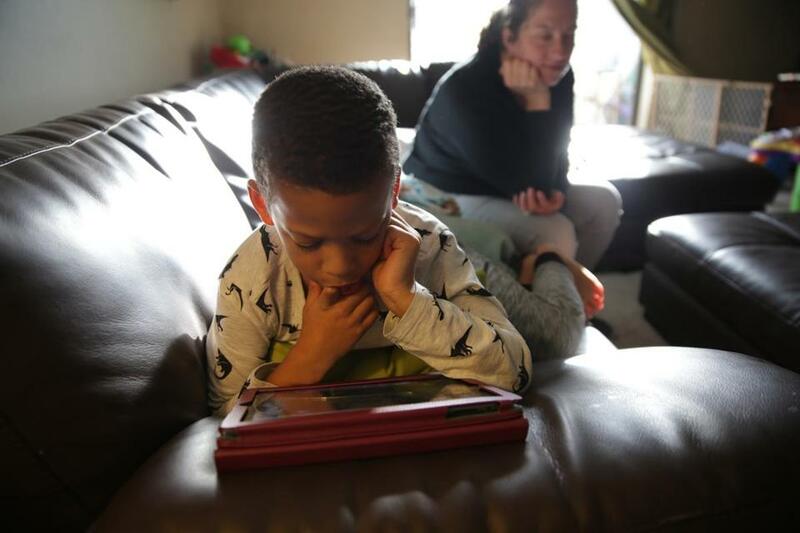 Third of four stories on how families could be affected by charter school expansion. For other entries in the series, click here. 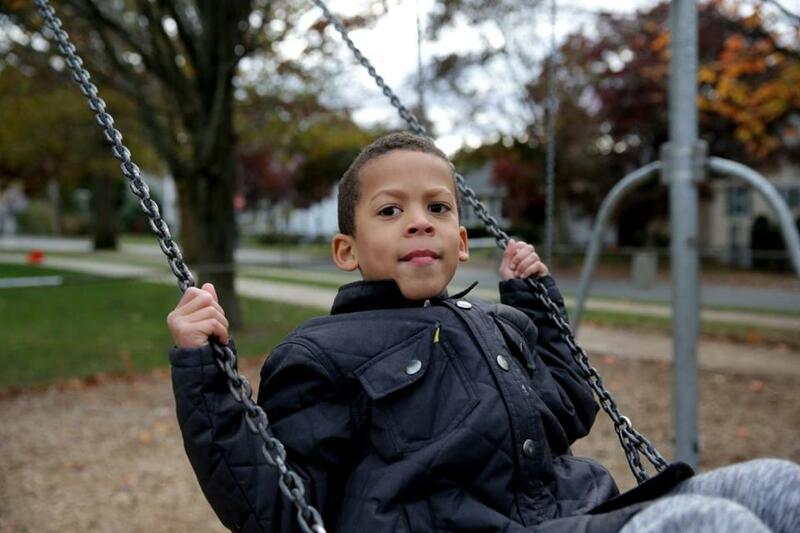 MALDEN — Seven-year-old Kiernan Ceide zips through the park, zig-zagging on his scooter before jumping in a toy car that eventually runs out of gas — or that’s how the imaginative second-grader describes it before grabbing a blue bucket to “fill” the tank. Kiernan has ADHD and sensory processing challenges, and the more he can move, the better he behaves. It’s a lesson that his mother, Amanda Ceide, said Mystic Valley Regional Charter School refused to accept when he was a kindergartner there. The loss of free time, including recess, was a common punishment for the fidgety 5-year-old, who acted out by spinning, talking — or having full-scale tantrums. He was suspended six times in four months. “He was made out to be a perpetrator,” said Ceide, pushing Kiernan’s baby brother, Soren, in a toy car of his own. Kiernan didn’t stay long at Mystic Valley. Ceide and her husband withdrew him before the school year ended and enrolled him at Forestdale School, a traditional public school in Malden, where they live. Charter schools have long been criticized for failing to adequately serve children with disabilities. Parents who say their children were punished for behaviors caused by their disabilities have become outspoken critics of Question 2, which would authorize up to 12 new or expanded charter schools annually if it’s approved by voters in November. Should Mass. lift charter school cap? Question 2 would allow some charter schools to expand and some new schools to open. As taxpayer-funded, public schools, charters are required to educate all children, including those with special needs. They receive a tailored education plan designed to help them reach their potential. Martin Trice, the director of Mystic Valley, declined to speak specifically about Kiernan’s experience at the school, citing privacy laws. But he said the attrition rates and academic performance of his school’s special-education population are on par with the six districts from which it draws students. According to state data, Mystic Valley exceeds state targets for the performance of special-education students, but its suspension rates for students with disabilities exceed all but one of those districts. “Having a well-mannered, disciplined environment is a very important part of who we are,” Trice said. Kiernan’s short academic history — from a private Montessori school in Lexington to the district’s Early Learning Center to Mystic Valley and now, Forestdale — is revealed in hundreds of pages of school and medical records that Ceide provided the Globe. Teachers first noticed something was amiss when Kiernan was 3, before he was at Mystic Valley. Loud environments made him uncomfortable. He was more active than other students. He bit several classmates, so the school had him evaluated by a special educator, who said he was displaying symptoms of a sensory processing disorder. Kiernan Ceide’s parents say he is doing better at Forestdale, a public school in Malden, than he did at Mystic Valley charter school. Kiernan continued struggling to control his impulses and focus. He only liked crunchy foods and sucked his right index finger. So he was evaluated again, and a developmental pediatrician diagnosed him with ADHD, or attention-deficit hyperactivity disorder, as well as sensory processing issues. “In the realm of normal, he was a little bit outside,” Ceide said. When the time came to enroll Kiernan in kindergarten, Ceide opted for Mystic Valley, which educates about 1,500 kindergartners through 12th-graders. About 14 percent of the school’s students have special needs, according to state data. 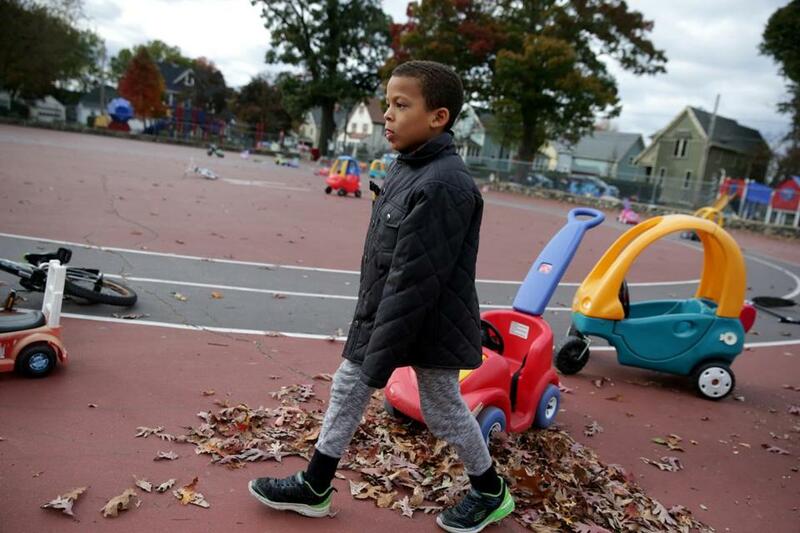 More than 3,500 children are waiting to get into Mystic Valley. The school has a swimming pool and a rugby field. It also has high standardized-test scores, high graduation rates, and high college acceptance rates. She entered the admissions lottery and won. But the prize came with a warning from his instructors at the Early Learning Center: Mystic Valley might not be a good fit for Kiernan. She was assured Mystic Valley was required to meet all students’ needs, and the school provided psychologists and occupational therapists. But the sticking point became the discipline policy. Each kindergartner received a behavior chart. Everyone started on green. A warning resulted in a color change to yellow. Another warning meant a blue mark and the loss of 10 minutes of free time. A red mark meant a call home and 30 minutes of free time gone. Continued misbehavior resulted in “no color” and generally was accompanied by a suspension. Kiernan’s behavior deteriorated as the school year progressed. He had eight “no color” days before winter break. The school told her Kiernan’s behavior would improve through consistent discipline, according to his mother. She said she disagreed, arguing that his behavior was a product of his disabilities and the punishment made his behavior worse. His pediatrician wrote a letter to the school saying as much. She wanted to know what the school planned to do differently. “They would say, ‘Nothing,’ ” she recalled. Then she would ask the school: How do you expect things to change? “And they would say, ‘He’s going to change,’ ” she said. The breaking point was the holiday pageant. Students practiced daily, and the jostling and singing overwhelmed Kiernan, who acted out. Ceide said she asked if a teacher could help mitigate the overstimulation by standing next to him, providing reassuring gestures when he became anxious. The school refused, she said. Kiernan had a meltdown the day before the show, lashing out at a student who he said pushed him earlier. He bent the little boy’s fingers back and pushed two teachers. “It’s a completely different environment,” Ceide said of her son’s current school, Forestdale. Kiernan saw a counselor weekly — until the family was admonished about his attendance in a certified letter. By February, she enrolled Kiernan in Forestdale. “It’s a completely different environment,” she said. An aide meets him in the office each morning as students arrive — a noisy, crowded time that can be difficult for Kiernan — and the two walk to his classroom. Ceide said meetings with the school’s administrators and special-education specialists feel more collaborative and focused on problem solving. Some of his disruptive behaviors are still there — but they are dealt with differently. Just this week, a letter was sent home, saying Kiernan elbowed a classmate. He was sent to an administrator, who made Kiernan write a letter of apology. He has had three major incidents, those that require a call home and a sit-down with school staff, in the year and a half he’s been at Forestdale, she said. The approach appears to be working. If you ask Kiernan to name his favorite schools, Forestdale makes the list. (Mystic Valley does not — it’s his least favorite.) Sitting in the car on the way to the park one recent afternoon, Kiernan recited the lessons learned from a book read in class. “You’re filling my bucket, and I’m filling your bucket too, like, making you happy,” he shared. “Who else fills your bucket?” his mom asked. And then he found a toy kazoo. Should Mass. lift the charter school cap? When does charter school politicking cross the line?